Description: A map of the southern tip of peninsular Florida showing Lake Okeechobee, the Big Cypress Swamp, and the Everglades. 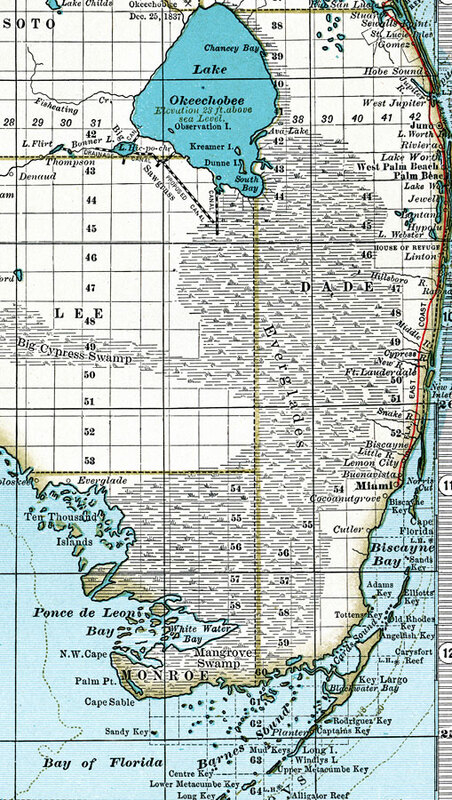 The map shows existing and proposed drainage canals at the southwest end of Lake Okeechobee current to 1897, before the large Everglades drainage projects were started to the southeast of the lake. From the map it is possible to see the general flow of the Everglades southward and turning to the west before entering White Water and Ponce de Leon bays on the Gulf of Mexico. The effect of the Miami Ridge, which runs along the east coast from approximately Palm Beach south to Card Sound, can be seen as preventing the Everglades from flowing to the Atlantic rather than the Gulf of Mexico. From this map it is also possible to see the effect the Everglades had on land surveys in 1897. With the exception of the Everglades and Big Cypress Swamp, the entire peninsula has been surveyed and marked based on the Tallahassee Meridian and Tallahassee Base Line established in 1824.